The crowd turns their cellphone cameras to the stage as Vice President Mike Pence appears on stage in Kansas City, Missouri. The visit was part of a tax policy tour hosted by the group America First Policies. 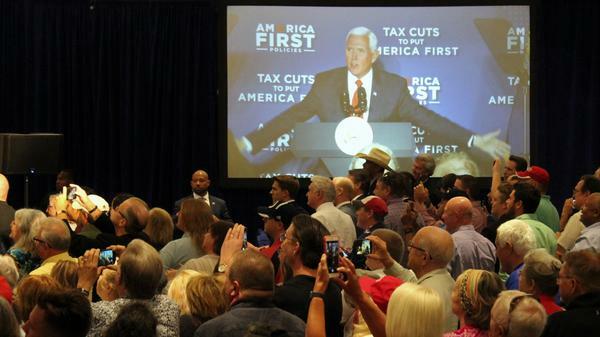 Pence told the crowd at the downtown Marriott that the trade disputes with China, Canada, Mexico, and Europe would ultimately lead to better deals and open markets for agriculture and livestock producers in states like Missouri and Kansas. The vice president’s comments come as the Trump administration considers yet another round of tariffs on Chinese goods, which could prompt a further response from China. The world’s most populous country has already slapped retaliatory tariffs on some U.S. agricultural products, including soybeans. Protesters outside the event blasted the administration’s stance on immigrant rights and abortion issues. And there were a few hecklers in the crowd inside the event hall. Moments after Pence took the stage, one man took aim at the vice president for the administration’s policy, now ended, that separated children from their parents at the U.S. border. “Mike, where are the children? Shame on you,” shouted one man before he was hauled out by security. Pence took the protest in stride and the majority of crowd of several hundred was clearly in the vice president’s corner. They shouted “USA” as the demonstrators were removed from the room. He urged the crowd to stay motivated and involved as the nation nears the first midterm election since President Donald Trump took office. The vice president voiced his support for Missouri Attorney General Josh Hawley, who is expected to win the Republican primary and take on U.S. Senator Claire McCaskill. Pence chided McCaskill and other Democrats for opposing policies President Trump has pushed for, including the tax cuts signed into law in December. “This is the kind of obstruction that the American people have had enough of from Washington D.C.,” Pence said. Republican Congressman Kevin Yoder of Kansas did not attend the event, but he also was the beneficiary of some kind words from the vice president. Pence held a fundraiser for Yoder earlier in the day. “Kevin Yoder’s been working hard, working hard to advance the president’s agenda,” Pence said. Yoder is facing a primary challenge and a crowded field of Democrats vying for the 3rd District seat in the Kansas City area. It’s a seat both parties are eyeing as a potentially close race. Pence’s endorsement of Yoder also drew the attention of Kansas Democrats. “This November, the Third District has a chance to elect a representative who will actually meet with their constituents and put working Kansans ahead of special interests,” Corson said.